Pinfest has drawn to a close for another year. We, as a group, rode the crest of excitement for 48 long hours–some more, some less–but now that it is over we have no choice but to begin the countdown until next year’s show. I ate my fill of pretzel wraps from the farmer’s market, met a few new friends whom I knew via avatar only, and I was lucky enough to bring home a project machine to keep me busy for the foreseeable future. A group of us from the Toronto area started a convoy of vehicles down to Allentown early Thursday morning, in order to arrive by 3pm to set up the games that accompanied us. The show is not open to the public on Thursday, but the doors are open to anyone bringing a game to set up (between the hours of 1pm to 9pm). After checking in at the venue’s registration and the games for the group were set up to our satisfaction, I took it upon myself to help out some of the other folks at the show… by “play-testing” THEIR games. You know, just to make sure they were set up correctly for opening day. I played ‘til I had my fill, and it was a godsend to have any game in the entire room available to play with no lines or crowds to battle. 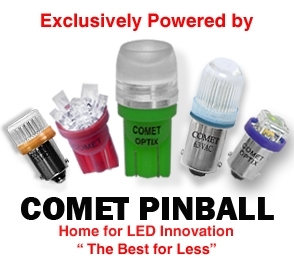 If you are going to do Pinfest, I urge you to bring a game. Not only does it help the event, it is your ticket to a free preview of the show. After leaving the venue, I ate a sushi dinner with some of the other Canadian collectors and then proceeded to drink to excess. Not a good choice, seeing as it was an early morning the next day and I had a belly full of raw fish…but I made it…barely. The show hours this year were Friday Noon to 9pm and Saturday 9am to 8pm. $17 admission fee per day, per adult, with no weekend passes available. Bring a game and you get free admission for as long as the game remains in the free play area. – two, yes, two Bally Spectrums. No Bugs Bunny Birthday Balls…the bar was set high after last year when three showed up. Also, I didn’t recall last year’s show being so heavy on Gottleib System 80 games; there were a ton this year…which ain’t a bad thing. They say the best System 80 game is someone else’s System 80 game anyway, because when it has issues, and they always have issues, you aren’t the one who has to repair it! Sadly, an Amazing Spiderman, which I would argue sports one of the most beautiful art packages of the 1980s, sat dark all weekend. 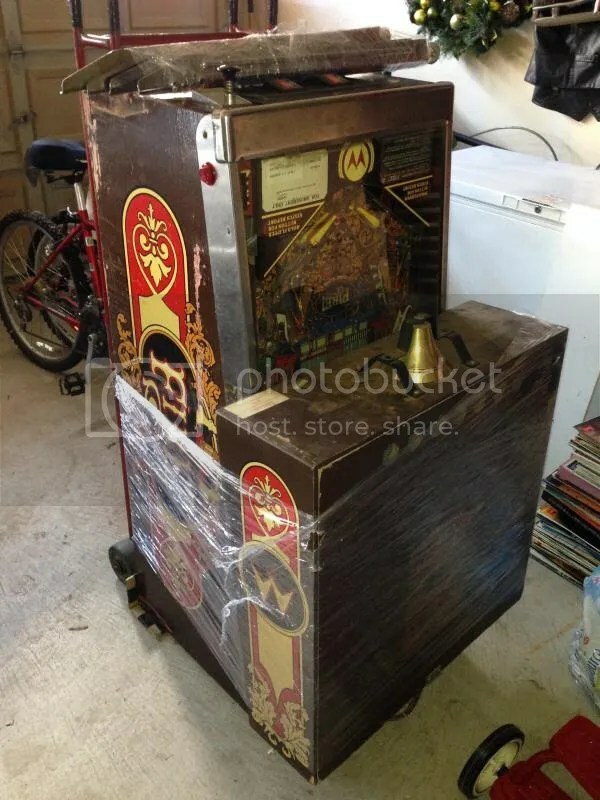 I didn’t play too many DMD era games, I stuck with early Solid State, and, in an effort to expand my knowledge of games from the golden age of pinball, I put a lot of time on some lovingly restored EM s. Two electromechanical gems that stood were are a lightly used Golden Arrow with only 16,000 plays on it and the soccer-themed Team One. 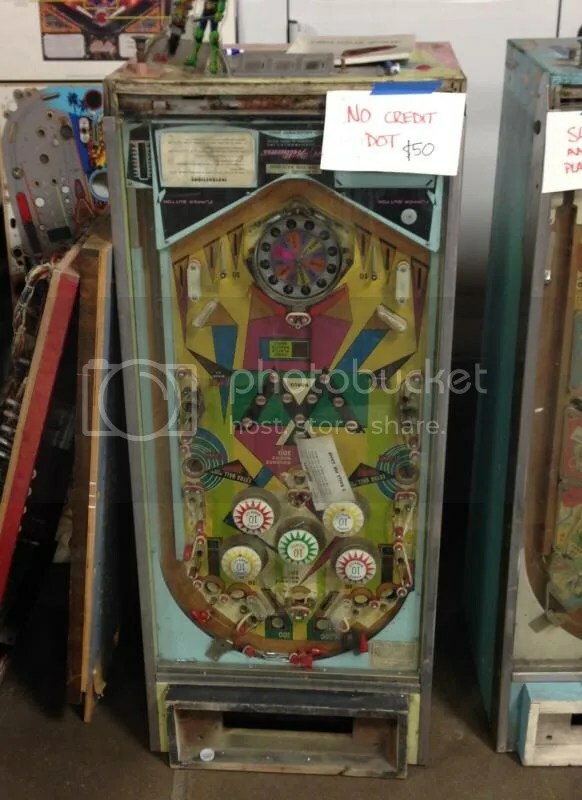 Both were a blast and both had me chasing specials all around the damn playfield. Jersey Jack was on hand with a few Wizard of Oz machines, including a Ruby Red edition, although I didn’t take the time to play any of them. The boutiques were also there in the form of Wrath of Olympus and America’s Most Haunted. 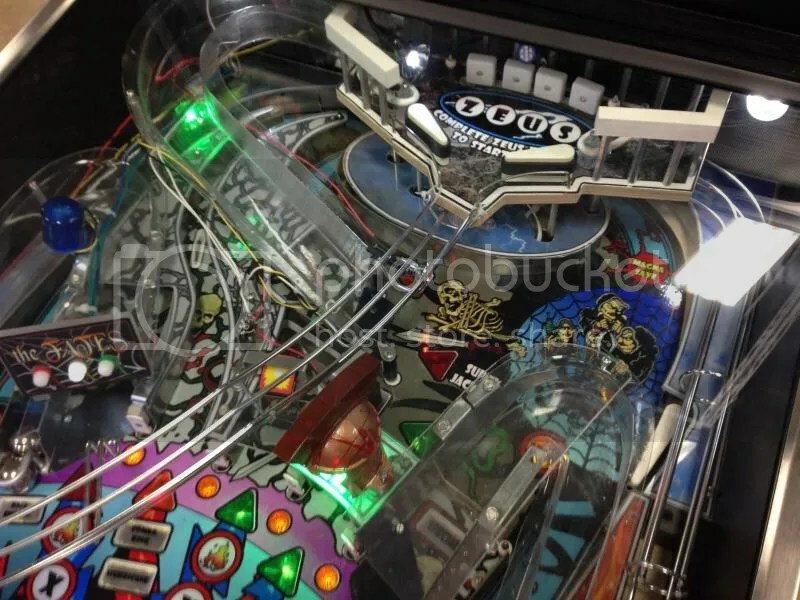 I had a couple of games on Riot Pinball’s Wrath, and I must say, this game is the real deal. Even as a prototype, the game felt solid and had unbelievable shot physics. I’m not even sure what I could compare it to…a bit Shadow-esque? The left orbit/upper right flipper/upper playfield ramp/upper playfield ramp flipper combo feels really, really good when executed seamlessly. The soundtrack is heavy, with driving guitars and instructive call-outs and really pulls it all together. Riot had photos of new toys they plan to include in the next prototype revision, and with a little spit and polish on the playfield art package this game looks like it will make some serious hay. I didn’t get a chance to have a single game on America’s Most Haunted. It was down. Every time I went by to try to play it. Lots of concerned folks looking at the little green board in the backbox while on cellular telephones (“Collect call for Ben Heck from Pinfest, will you accept the charges?”). I was looking forward to giving this game a fair shake, ever since Nate Shivers of the Coast2Coast Pinball podcast raved about it at the Midwest Gaming Classic. I was wondering what I was missing. Sadly, it wasn’t meant to be. Lots of shopping to be done as well. All the usual suspects like Cointaker, Mayfair Amusements, and Marco Specialties had their tables set up in the main building. Business looked to be swift…Rottendog had “Sold Out” posted on many of their boards (great show specials available from the Rottendog crew), and the boys at Pinball Inc. looked like they had a very bare ramp table near the end of Saturday (completely selling out of their ramp stock for Creature from the Black Lagoon and a few others). New vendor Rob Kahr had his WPC daughterboard for sale and business looked to be successful for the newbie as well. 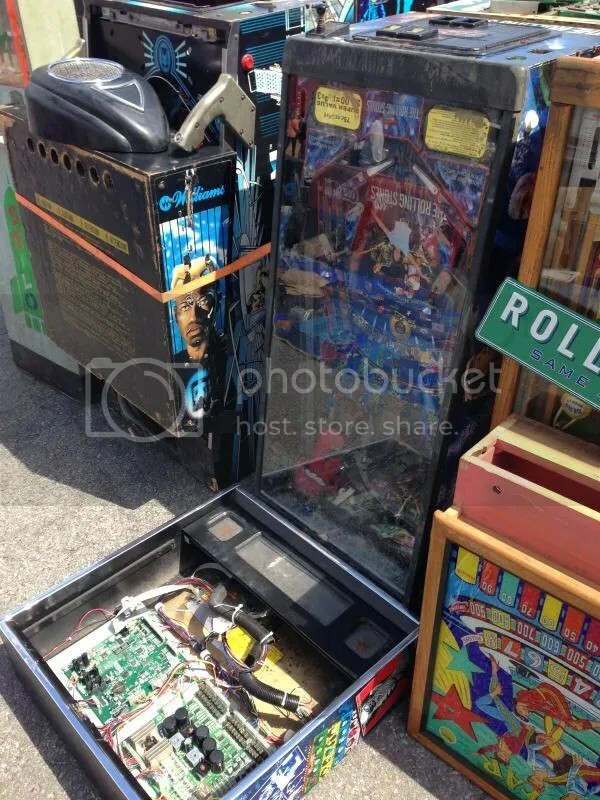 Out of doors, countless U-hauls and bread trucks displayed their discarded arcade wares at the outdoor swap meet. The weather cooperated nicely with sunshine and a cool breeze. One seller had what looked to be a Hurricane Katrina show special–an Iron Man and Rolling Stones which can be best described as mud-caked and water-damaged. EABundy came forward on Pinside and admitted that he bought the Rolling Stones, I’m sure to attempt to recreate the magic he was able to conjure up with the T2 restoration. I bought one of my treasures out of the back of one of these trucks as well…a Williams Fire! (which was the last game I featured on this site before leaving for Allentown…weird how fate works). The game was missing the display board which was quickly remedied with a brand new gas-less display board from the good folks at Rottendog for $100. This Fire! was, in my opinion, cosmetically superior to nearly all of the Fire! machines I’ve seen or played in the past. With a little wheeling and dealing, the price was too good to pass up, and I felt the need to have this Fire! make the 5 hour journey back to Canada with me. While loading the game onto my dolly, I was honoured to be briefly interviewed by Todd Tuckey of TNT Amusements…perhaps I’ll make an appearance on Mr. Tuckey’s YouTube channel? The game is a project for sure. It now sits in the garage, as I have not yet had the time, or nerve, to attempt an initial boot up. There was, however, a brand new, complete Marco rubber ring kit stuffed inside the cabinet…that has to be a good sign, right? That poo brown cabinet I was ripping on just two days ago will, with a little elbow grease, be sitting in my basement collection in the very near future. In all, the show was extremely well attended and had about 250 games for free play on the floor at its peak Friday afternoon. As the weekend wore on, that number dwindled, due to breakage and outright sales, but that is to be expected. There were a few bargains to be found. The $700 Bally Mousin’ Around didn’t last long, and I’m sure many didn’t even make it into the show from the parking lot. Anyhow, those who wanted popular fare (TAFs a-plenty, four I think), to old gems (two 60s Williams games, Friendship 7 and Heat Wave, are of note here), to the off-beat standards that show up year after year (I swear I played these same copies of Kings of Steel and Swords of Fury last year) would not be disappointed with what was on free play display at this year’s show. 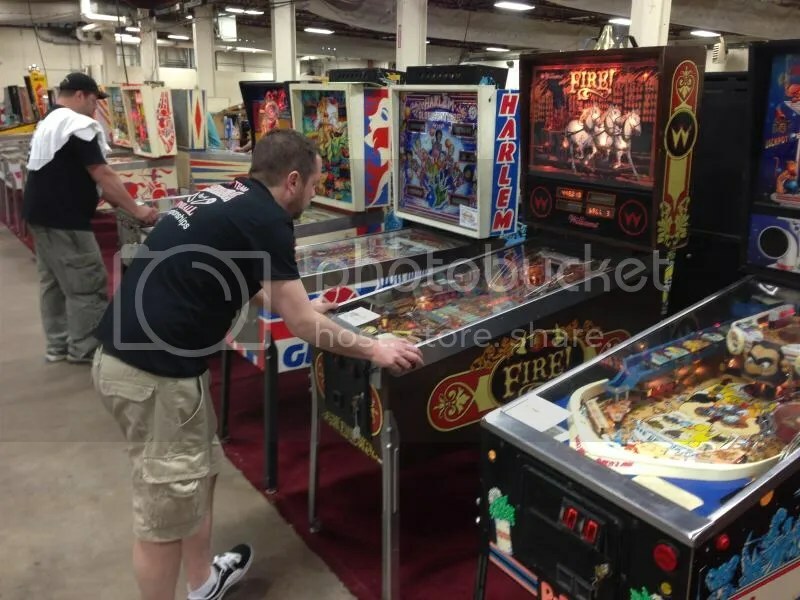 The Allentown Pinfest remains the undisputed king of grass roots, blue collar pinball shows. So who’s in for next year? Categories: News | Tags: Allentown, EABundy, Fire!, Friendship 7, Golden Arrow, Mousin' Around, Pinfest 2014, Pretzel Wraps, Stern Rolling Stones, System 80, Terminator 2, Todd Tuckey | Permalink.